Oughterard town has, for a long time, offered the surrounding area access to Seanaféistín and the south Connemara region via Station Road (which runs south from the town in front of the Catholic Church). However, this was not always so. Station Road, as its name implies, was a relatively modern construction, built simply to service the needs of the Oughterard train station, opened in 1895 (the fact that the road is relatively wide and straight lined in nature lends to this modern, foreplanned construction). 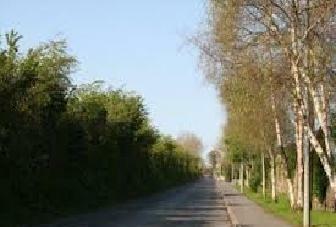 Before then the only roads in that area were those that looped around Canrawer village and down into Rusheeny. In fact, the village which was present in Clooshgereen further south was only accessible through fields and by simple trackways. However, the area still had access to southern Connemara via an early unpaved trackway outside of the town. 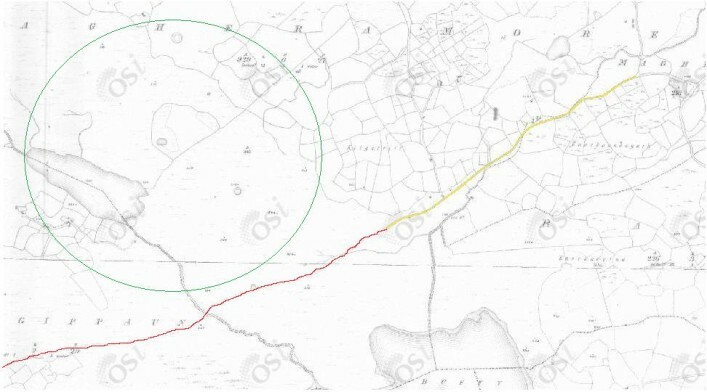 This track can be seen on the 6 inch Ordnance Survey Map from 1829-41 continuing on from a small bóithrín at the junction between Maghermore and Magherbeg. This road is now a cul-de-sac because of the disuse of the original trackway. It is hard to determine how old this route may have been but given the presence of several small hamlets and a few historic monuments along the route it is prossible that it is of an early, possibly even ancient, origin. The creation of the new road to replace the trackway from Oughterard as opposed to Magheramore shows the continuing urbanisation of the small village in the late 19th Century and its growing importance as a central hub for Connemara.